開け実 hirake mi ... fruit which opens, because it looks like an open mouth. mitsuba akebi 三葉通草（みつばあけび）"three leaf acebia"
Akebia quinata (Chocolate Vine or Five-leaf Akebia) is a shrub that is native to Japan, China and Korea. It grows to 10 metres or more in height and has compound leaves with five leaflets. The inflorescences are clustered in racemes and are vanilla-scented, with three or four sepals. 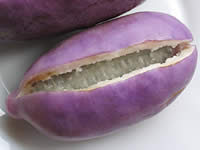 The fruits are sausage-shaped pods which contain edible pulp. In China A. quinata is referred to as 木通 "mu tung" (Wade-Giles)) meaning "perforated wood". It is also occasionally known as 通草 "tung tsao" (Wade-Giles)) meaning "perforated grass". In the Chinese pharmacopoeia it is believed to be therapeutic as a diuretic, antiphlogistic, galactagogue and analgesic. The principal use of the herb in China is as a traditional remedy for insufficient lactation in nursing mothers. 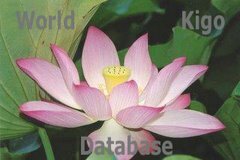 The medicinal part of the plant is the woody stem which is sliced in transverse sections and prepared as a decoction. The stem contains approximately 30% potassium salts thus giving the diuretic action. 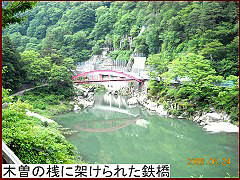 Yamagata is one of the most important growing areas for akebi. akebia meat tasts good with fat, like tempura or simply fried with shiitake mushrooms or other vegetables. 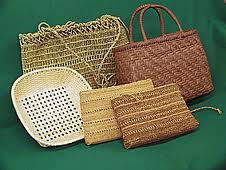 The vine is used to make baskets and containers.
. 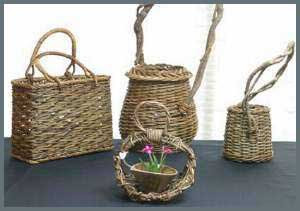 Folk Craft from Nagano . is also popular in many parts of Tohoku. 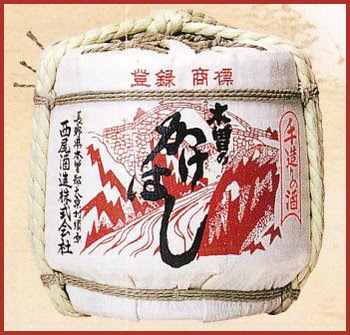 During the long winter months people used to make all kinds of containers from the local vines, especially akebi. There are workshops to teach the art to the younger generation and the pieces become popular souvenirs for tourists.
. koke uzumu tsuta no utsutsu no nebutsu kana . Roboku must have lived a very simple life of a recluse, planting vine creepers on purpose and just a few poles of bamboo in his garden. 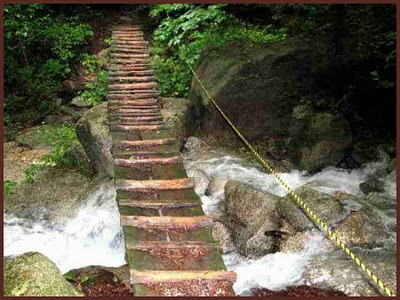 This was an old fragile bridge in the times of Basho, at the Nakasendo, Agematsu juku　上松塾. Usui Tooge 碓氷峠 Usui pass. The new metal bridge at Kiso. binboo kazura 貧乏葛（びんぼうかずら） "poor man's vine"
nihsikizuta 錦蔦 "brocade leaves of tsuta"
At certain court rituals (新嘗祭、大嘗祭、豊明節会（とよあかりのせちえ）, the participants used to wear a special head gear with vine on both sides to show humility (monoimi 物忌). 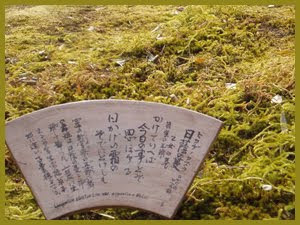 Sometimes moss (saruogase さるをがせ) was used or "moss from the pine" matsu no koke 松の苔. Later white or colored strings were used. The "leaf of the heart" could be a leaf of chochikubai pine, bamboo and plum, cherry or chrysanthemum. This hokku is from the 8th month (September) of 1822, when Issa was visiting a mountainous area not too far from his hometown. People who lived in the mountains tended to eat mainly millet and other grains that could be grown in dry fields on the slopes. Meshi can mean either the main food one eats, or, in a lowland context, cooked rice. Masaoka Shiki 正岡子規 visiting Nikko 日光 .